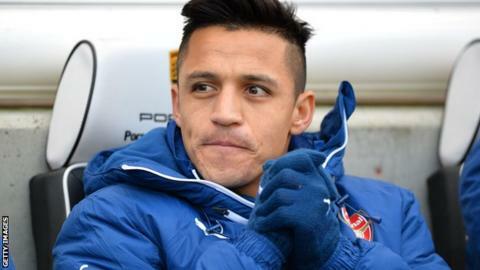 Arsenal forward Alexis Sanchez will miss the Gunners' Premier League trip to local rivals Tottenham Hotspur on Saturday with a hamstring problem. The Chile international, 26, has scored 18 in all competitions since his £35m summer arrival from Barcelona. Striker Danny Welbeck has recovered from a thigh injury and will feature for the first time since 28 December. Fifth-placed Arsenal will also have to make do without midfielders Jack Wilshere and Alex Oxlade-Chamberlain, who are both yet to return to full training following injury lay-offs. Tottenham are one place and two points below their rivals in the table. Read more on How long would it take you to earn a top footballer’s salary?